Large cohort studies such as YOUth crucially depend upon a highly-structured dataflow and workflow. This requires standardized procedures which form the backbone of a transparent and efficient system of data collection, processing, and storage. Transparency is operationalized by offering continuous insight into the “what, why, how, and how good” of all aspects of the study, for all parties involved. Moreover, the “when” is of particular importance for orchestrating the workflow of the various teams responsible for experiment development, personnel training, and participant recruitment.To facilitate a highly-structured data- and workflow, we are developing STEP: STRUCTURED TOOLS for ENHANCED PROCESSING. STEP has a modular design, with modules providing unified coverage of all aspects of research. However, they can also be used independently, allowing for flexible solutions to meet specific research or study requirements. STEP Logistics: facilitates all planning related processes, including scheduling software and, for example, the ability for test-assistants to login from home and see and change their work roster. STEP Info center: is geared towards information sharing, ranging from STEP Classroom for educational purposes, STEP Academy for new employees, STEP Library for sharing knowledge, to STEP Society for communicating with societal partners. STEP Shopping center: is setup to handle data request as well as issue research tools. 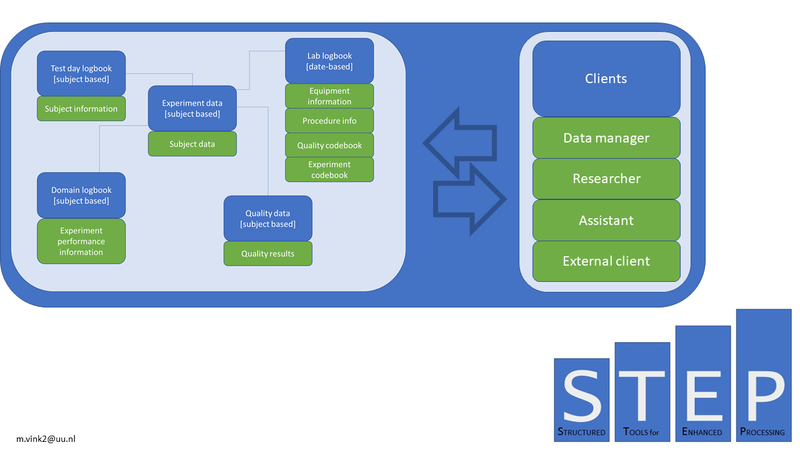 STEP Data center: serves to store all sorts of data in a structured manner, including research data, quality measures, software, documents, and publication packages. 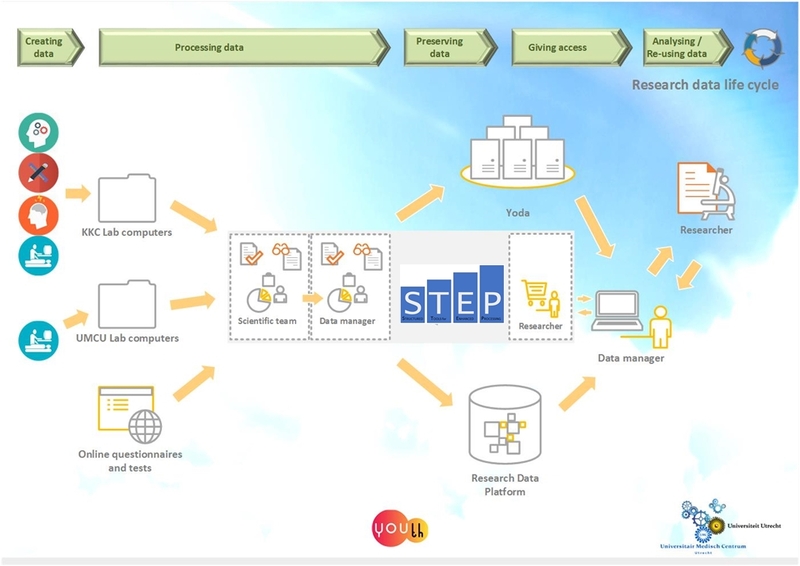 STEP Administration: is a data management module, that manages data request, but allows provides overviews on study progress, quality measures, number of inclusions etc. STEP is built on a database containing a unique identifier for each experiment. This identifier is used to link research data with corresponding quality measures and meta-data (protocols, technical specifications) that is crucial for understanding how the data were acquired and how they can be processed. Experiments can be easily added to this database, thereby flexibly adding to the study without the need for drastic reorganization. Around this database is an API that facilitates communication with various components. STEP further requires an underlying infrastructure for security (e.g., authentication and authorization), long-term data storage, automated data processing, intake and issueing of (large) data sets via web apps.